I can sense that the recession is coming nearer and nearer. First it was the recession in US and the rising of crude oil prices which hit Malaysian lately and seems that prices for retailed product has increased too for the the past few weeks. And now, petrol kiosk is not accepting payment by Credit Card. All sales have to be in cash. It has gone from bad to worst. Even Yoga Zone, Klang has been going through something very weird this few weeks. Either the Teacher did not turn up for classes or the Teacher has resigned. Rumors have been going round lately in the studio. I will refrained myself from spreading more rumors here in hope that they will sort out their internal problem. The only thing I’m afraid now is the closure of the Klang branch. I love the strategic location at the shop lot in the hearts of Klang town which is very near to my house. Not to mentioned, we do not have to pay parking which is a cost saving to us. They have been talking about a new branch opening in a commercial tower. I can feel the pinch now. Not only it is a bit further and inconvenience to me, each time I go there, I will have to pay for the parking too. Gosh, since the recent petrol price hike, everything seem not going smoothly at my end especially in expenditure. The kids school transport has increased from RM70 to RM90. I am fine with that as I can totally feel their pinch. Their violin lesson has increased from RM70 to RM80. For goodness sake, what does a music class have to do with the price hike???!!! &%$# The only thing that didn’t increased is our salary. That is so unfair! If Yoga Zone, Klang really closing down, I can’t be going for my classes as often as before. Oh, please God, please don’t let this thing happen! Making Any Sense At All? On the weighing scale, we have 2kg of stones and on another weighing scale, we have 2kg of cotton.Â Which is heavier? If your answer is the stones, you are wrong.Â They are both equally heavy cos both of them weight at 2kg. Halo?Â The room temperature is set at 40C.Â No matter how hot or how cold the outside weather, the room stays at 40C.Â Making any sense here? I am trying my best to blog as often as I can about my life and experiences here in yogajess not in the pre-text to teach or showing off (a bit got la) but as a reminder to myself.Â I am not pro and not a qualified Teacher either.Â After practicing Yoga for a year now, I am happy to see the progress I’ve achieved so far. Sometimes, seeing myself in photographs really amazed me.Â Not that we have a chance to catch a glimpse of ourself in the studio mirror.Â You know what I mean?Â The head is either looking upward or downward.Â For example this picture which I took over the weekend in Pangkor Island Beach Resort (formerly known as Pan Pacific Pangkor). The first word that came out from my mouth, “WOW!Â I look beautiful!” *cough* I mean the sunset is beautiful.Â I wanted to snap more poses but suddenly I just can’t think of anything that is outstanding in a silhouette. Other time then.Â At the mean time, I really love this shot ;). 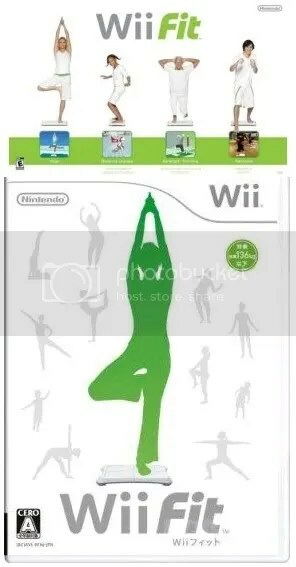 I am so in love with the new Wii Fit console by Nintendo especially the Yoga component. To start playing the game, firstly you must buy the Nintendo Wii game console which costs about $250 and the Wii Balance Board retails at $90. Prices could varied elsewhere. I do find it weird doing Warrior I pose with one foot elevated on the 2 inches high board and the other on the ground. Isn’t that what we called body imbalance? No wonder the poses is so limited comparing to the original 1000 poses we did at the studio. 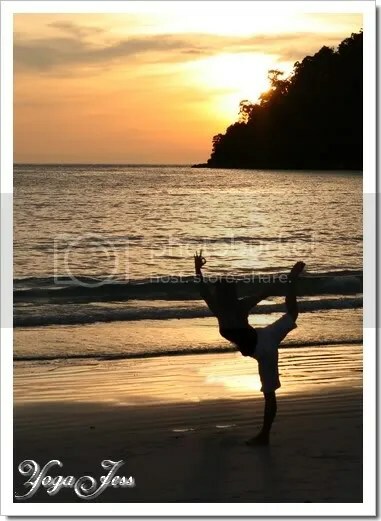 But then, the console is a good buy as it can be used for other games too like jogging, step aerobics, hula hoop, rhythm boxing, find step, skiing, snowboarding, heading soccer ball, tightrope walk or balance bubble.